Here is another example of a device going on sale in the stealthiest fashion, sans any official announcements. 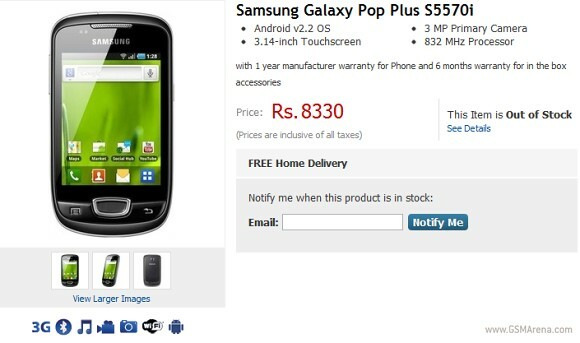 This time, we stumbled upon the Samsung Galaxy Pop Plus S5570i (its predecessor is better known globally as Galaxy Mini) in an Indian online store. In a typical Samsung fashion, the Plus moniker stands for an increase in the CPU speed of the smartphone. The Galaxy Pop Plus apparently sports a CPU, clocked at 832MHz - a hefty bump from the 600MHz processor of the Samsung Galaxy Pop/Mini S5570. The rest of the device's specs have remained unchanged. The Galaxy Pop Plus's price tag of Rs. 8330 ($170) appears to be well accepted, as the device is already listed as out of stock. An email notification however, is available for the overly eager potential users. Still no Android Gingerbread for it, though.